Video of Gallery’s Brand Story from Gallery: Carts.Kiosks.Portables. on Vimeo. Managed by Three Over Four; shot, directed, and edited by Hoptocopter Films. 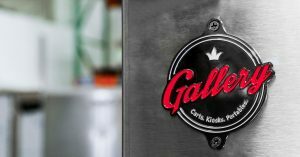 Gallery (formerly Carts of Colorado, Inc.) is a global, Colorado-based, mobile food, beverage, and merchandise cart, kiosk, and portables company that was recently ranked a top-200 privately held company in Colorado. With a long history that began with a single hot dog cart on a downtown Denver street corner, Carts of Colorado has become one of the leading companies in its industry with products in stadiums and venues around the world. A home run was hit in the Chicago Cubs’ historic 2016 World Series and you could see a Carts of Colorado bar in the highlights. Their products are seen in Red Rocks, the Indy 500, and in virtually all the newest and brightest stadiums and venues. But the brand had become stale. It is a family-owned business with little attention paid to the branding discipline throughout the years. The founder and current CEO has decided to step away, and his son is stepping in to take the reins. This represents a number of critical issues for the company but also a huge opportunity: What better time to launch a new brand for this 30-year-old company than with this handoff to new leadership? The time was right for change, especially given how the company’s name and brand limit the scope of what the company can be, who it can serve, and where it can compete. Gallery engaged Feed Media, a Denver Public Relations firm that handles everything from hyper-local campaigns to full-scale national/international programs, for help. Feed Media turned to Three Over Four (formerly Aaron Templer LLC) to lead the brand strategy and naming process. During preliminary research, we discovered that customers freely and effortlessly swapped the name “Carts of Colorado” with the name of the outgoing owner and president. This supported leadership’s concerns. Relationships were very deep and strong between outgoing leadership and key, bread-and-butter customers. With such a strong foot in the past, the new brand and naming process had to honor these relationships. In renaming and rebranding Carts of Colorado, AT’s process was heavily rooted in primary research. We reviewed as many materials from Carts of Colorado as possible; held numerous meetings with internal staff; visited their manufacturing facility; observed an install at a sports stadium; interviewed several clients on site; wrote and created a brand platform using the cube metaphor; presented and revised until approved; renamed the company; created an implementation and launch plan; and project managed everything from top to bottom. We took data from the research and focused on key areas for name development: Solid quality, global reach, the sports industry, the differentiation on design, various amalgams, the Colorado heritage, ideas around wheels (the fun part about their mobile products), annexes (they bring products to people as opposed to asking people to come to products), and points of sale. It bridges yesterday to tomorrow. …while looking forward to the new possibilities the son brings to the business. It reminds customers—new and old—that they get 30+ years of experience. It puts the customer first: Their food, beverage, or other products will be displayed in a gallery. It’s sticky, easy to remember. It’s an elevated brand, something to proud of.